This long sleeve t-shirt is one of my favorite purchases. It comes in 17 different colors and it is only $18! I am wearing xs. They are great for layering. I also got it in white (pictured below) My jeans are here. My shoes are form last year pretty much exact pair here (on sale) and my bag is sold out but I also love this. This chambray top is seriously the softest chambray shirt I own. I love it! It comes in 4 colors and it is on sale for $31. Such a great find. I might get it in a other color. I live in shirts like this. My jeans are here. These are my favorite shoes. And my bag is here. This is the same t-shirt as the first picture (only $18). My hat is here (on sale for $17). Kate Spade Phone case (on sale). This sweater is perfect for Fall. It comes in 5 colors and is on sale for ($30). This is another one of my favorites. 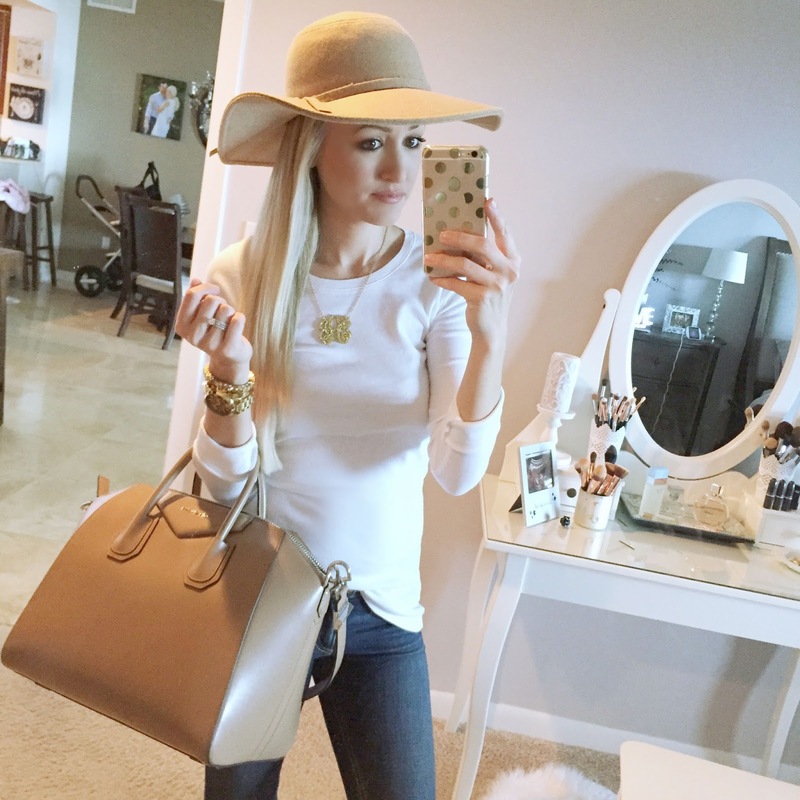 Such a great basic for everyday and it is so comfortable. I love lightweight sweaters like this. My favorite leggings are here. 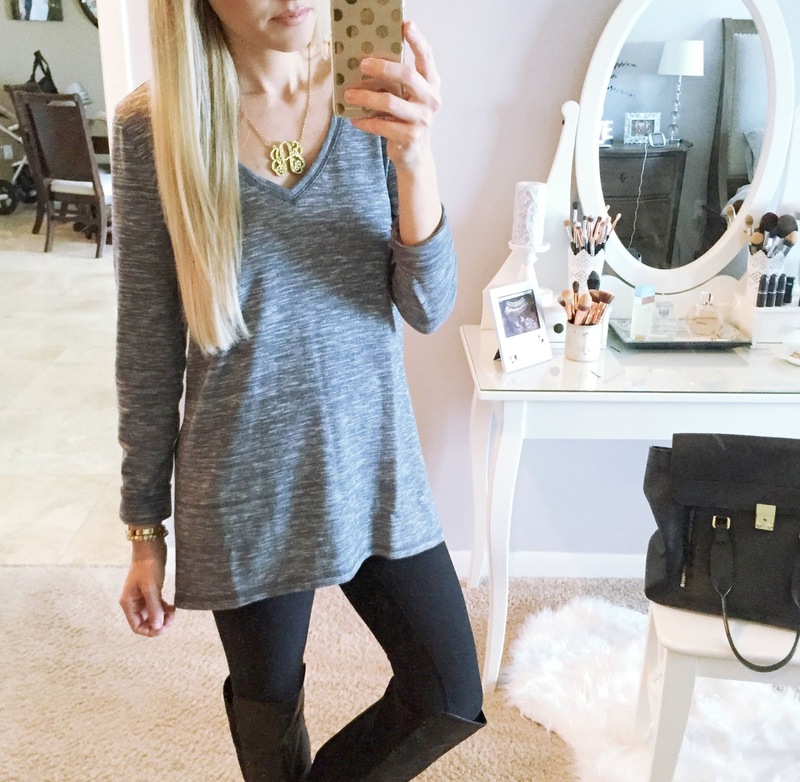 Seriously the best leggings for only $34! I have been wearing these non stop! My boots are from last years sale but I love these and these. This plaid boyfriend shirt! Well the fact that it has pockets makes it pretty much the best shirt ever! It is very oversized I am wearing extra small. I would say to maybe go a side down. It will be so cute with leggings and boots. My shoes are here also love these on sale. This is the same tunic that I have in white. I love it so much that I also got it in navy blue. It comes in 12 colors and is on sale for $38. I am wearing regular extra small. My jeans are old, love these. My shoes are Vince. I can;t find them online. Similar here on sale for $38. Today I just wanted to share some more of my Nordstrom sale purchases. There are still so many great things available. It is the perfect time to stock up on great things for Fall! I am so excited and nervous because I am headed to the salon today to make a drastic change to my hair! I haven't changed my hair cut and color in a very long time and I just feel like I am ready for a change. So I am just going for it. Lets hope I don;t regret it! You can follow along on snapchat my name is Jadealisonscott! Thank you so much for reading! It means so much. love all these looks! can't wait for fall! 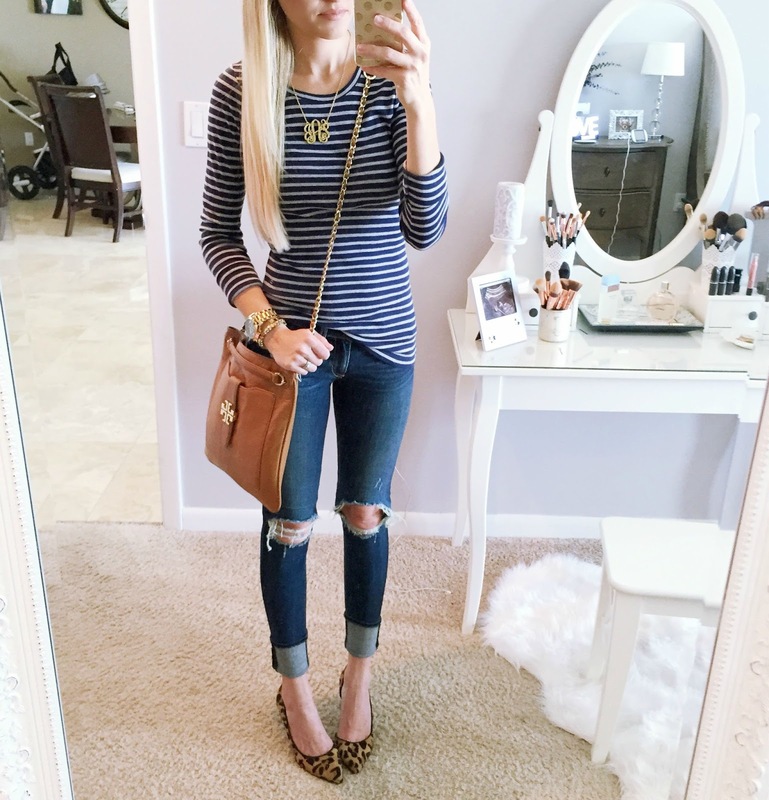 Great sale finds and such a stylish outfits! I love the t-shirts (the all white and the striped), but wondering about the fit around the waist and hips. Does it fit close to the body? these new pieces all look great on you! I've ordered a few of the same items myself, actually :] can't wait to see your new hair!! You are seriously the cutest! Love those otk boots! I love your style! You always looks so effortlessly put together. Amazing Nordstrom finds- probably the best I've seen! I so wanted this chambray top but it is sold out in the color and size that I want :( It looks gorgeous on you though! Love the sale purchases! You have to love Nordstrom's Anniversary Sale! Love all your purchases! Wish I would've snagged the TB purse! Great picks! I love them! Great roundup! I ordered that plaid shirt as well and cannot waitttt to get my hands on it! Gorgeous as always! LOVE the dress! 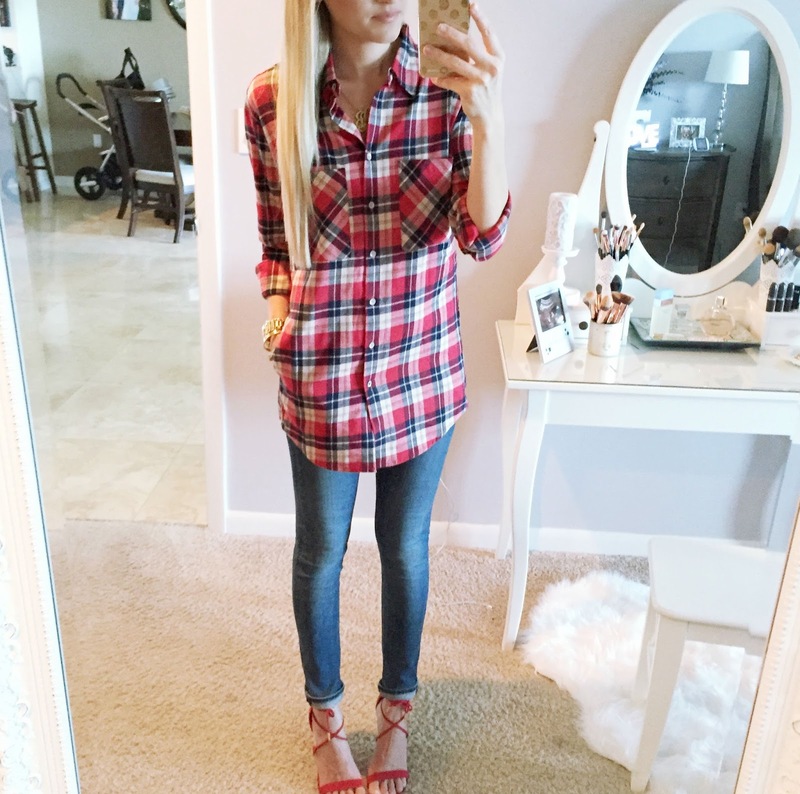 Your outfit round-ups are perfection, I love the collection of the loose tees, fitted jeans, and perfect shoes! Love the sweater and plaid shirt. What size did you get in the grey sweater? XS or S? You have the cutest style! I want it all!! So many great outfits, it is really overwhelming. Love your style! Love it all!! So many cute tops!! I can't believe you actually blocked me from your IG. I've been following your blog for over a year now. It's so childish to block me because I commented on your new hairstyle. Never disrespected you or said anything out of context. Just voiced my opinion and also said "I liked it better before". I guess you were just lookin for "ohhhhh I love it comments". That being said, I love your style. No, I was not only looking for "ohhh I love it comments". But I have been getting a lot of negative comments and people being mean or rude and I am honestly over it. I would like Instagram and my blog to remain something that keeps me happy not something that I look at and see negative comments. It is very hard to put yourself out there and sometimes it gets to me. Sorry, I never meant to be rude or negative..
Love your scores here! What size did you get in that super soft chambray top?? I LOVE it and your style. Please keep it up! !